Paterno I had been to Paolo Guarnaccia’s family farm in 2009 when a group of us had dinner with his family while talking about the Simeto Valley. Now I saw it differently as we joined his wife for a simple and delicious lunch there. I had not fully realized that the farm was still in Paterno, simply on the other side of the hill from the Norman castle, old church and cemetery I had visited several times this trip. With 23 hectares of land assembled over 30 years this was a large set of groves tended by Paolo, tenants, and volunteers that came throughout the year to help and to learn organic farming techniques. Everything about this operation had a “social” purpose, as they say here, right down to the room that hosted school field trips and the vegetable plot tended by various people in rehab or other programs. For the first time I toured the huge “warehouse,” as Paolo calls it, which is leased from the regional government, but is a combination packing shed, orange sorting and processing operation, olive oil manufacturing plant, and much more. 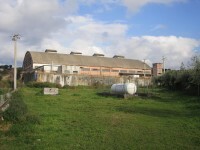 Consorzio Terre Di Sicilia is a model, organic, educational, and experimental farming location, but it is also largely empty, inoperative, and laden with debt. 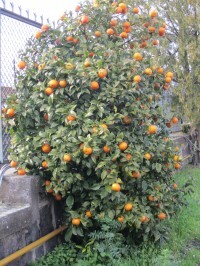 At one point serving 1000 customers all over Sicily with certified organic products, it now was little used, waiting for an EU loan of 200,000 euros over the last number of years, which still hadn’t arrived, and only a place for a couple of small farmers to sort their oranges by size with one of the giant machines. Paolo had tried to turn it all into a cooperative over 5 years, but it didn’t work out…just not enough interest. 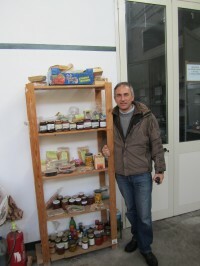 Similar to our friends with COMUCAP in Honduras and their coffee and aloe vera looking for markets, I started asking what it would take to get the marmalade made here over to North America where ACORN International could move it through Fair Grinds and other places to support the survival of farming in Sicily. Get ready for a headache. The blood oranges as fresh fruit are impractical to even consider because of cost and requirements to prevent Mediterranean fly from coming to our shores. Scratch that. How about fair trade, organic marmalade? Well, organic is easy. Rigorous Italian and European Union inspections are already in place which would meet any requirements. Fair trade, though, probably not it seems. This is not a co-op. Looking at the FLO affiliate website FairTrade Italia it seems they only bring in products from the rest of the developing world. When my friends have described Sicily as the Appalachia of Europe and of Italy, that doesn’t seem to count. There has to be a way. This stuff is too good not to save and survive. This entry was posted in ACORN International, International and tagged aloe vera, blood oranges, coffee, COMUCAP, Consorzio Terre Di Sicilia, fair trade, Honduras, Paolo Guarnaccia, Paterno, Sicily by Wade. Bookmark the permalink.